Thinking of home comfort in the retail market? Most Australian's automatically think Pillow Talk. With stores up and down the east-coast Pillow Talk is an iconic Australian brand. The high-profile retail business has recently implemented some significant changes. Responding to the upheaval in the retail landscape, Pillow Talk have carefully researched their customers and the market and have undergone a strategic rebrand. Pillow Talk has transformed their entire business image and built their brand communication around the concept of 'comfort'. Delivering this strategy required transforming their familiar retail stores into new, high-performance retail 'comfort zones'. Retail design consultancy ID Solutions was appointed to create the new store design. The test case was Pillow Talk's store in Robina Town Centre. "Creating a representation of 'comfort' in a space is one thing. Making 'comfort' work in the context of high-performance retail space is a delicate balancing act between form and function," says ID Solutions Design Director, Gordon Simmonds. This balancing act was made even more exacting by the shape of the store. Pillow Talk Robina has a comparatively narrow frontage. The challenge for ID Solutions was to design a store that not only sold effectively from the lease line but to entice customers deep into the store. How does 'Comfort' create an atmosphere that informs and inspires the imagination? ID Solutions recognised that 'Comfort' is a strong emotional response. Building 'Comfort' in a retail context requires creating strong sensory cues that link with familiar 'home' values and experiences. Designing a space which is both calming and visually rich, ID Solutions have created a retail environment for Pillow Talk with a distinct sensory signature. How can 'Comfort' be represented in a busy retail environment? Firstly, lighting design. Banks of cold fluorescent lights were changed to warm 'track lights' creating an immediate warmth. Lighting can be easily targeted to feature displays and product. The long, thin tenancy is effectively divided into zones by painting the ceiling and walls of the rear portion. A contrasting colour scheme effectively created intrigue for shoppers luring them towards the rear of the store (and through multiple retail areas). Multiple room displays were created in the shopfront to allow customers to visualise a room that has been completely styled in the Pillow Talk product. This also had the effect of creating a range of distinctive retail zones, complete with impulse offers and suggestive sell messages. According to Pillow Talk National Operations Manager, Greg Ferguson. These zones are a critical part of the brand transformation. "These zones intend to feel that you are engaged in a relaxing visit of someone's house - rather than a busy retail store." The unique and distinct environment creates the sense of comfort and then allows our customers senses - particularly sight and touch - to go to work. Pillow Talk is now a rich visual and tactile experience for its customers. ID Solutions completely overhauled the retail presentation of Pillow Talk. The racking and gondolas were reshaped and refashioned to align with the repositioning. Working closely with Ben Mc Cowan from Pillow Talk's in house design team. The gondolas needed redesigning utilising natural, wood grain finishes presenting a softer and more natural retail presence for their stock and impulse lines. The floor units provide multiple merchandising options to allow quick reconfiguration to suit various offers and product types. Early sales indications have the new generation Pillow Talk stores trading very well. 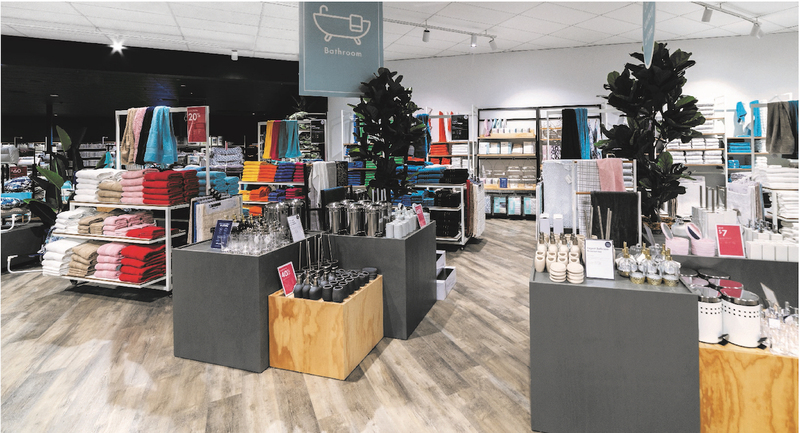 The new branding and store fit-out will be progressively rolled out across the country in the coming months. No doubt IDSolution's new retail store design is making Pillow Talk's management rest easier. Butchery is a craft. Butchery is a time-honoured skill practised by highly knowledgeable artisans. Creating a craft butchery that challenges design conventions and excites the public with something new and different is something else entirely it is an art. Most retail butchers are designed to display and sell their meats quickly with a minimum of involvement from the butcher. This eliminates most opportunities for customers to engage with the product and butcher's expertise. Peter Augustus, a boutique retail butchery concept in Brisbane's New Farm has a different vision. Not satisfied with just building another 'premium butcher' ID Solutions have turned the whole butchery retail service model inside out. Peter Augustus looks like no other butcher. The first impression one has of this store is that this butcher might have more in common with high-end jewellery. Display cabinets proudly showcase aged rib sirloin, and elaborately marbled wagyu beef cuts are positioned against backlit salt walls. The traditional service counter is gone and replaced instead with wall and a central island display case. 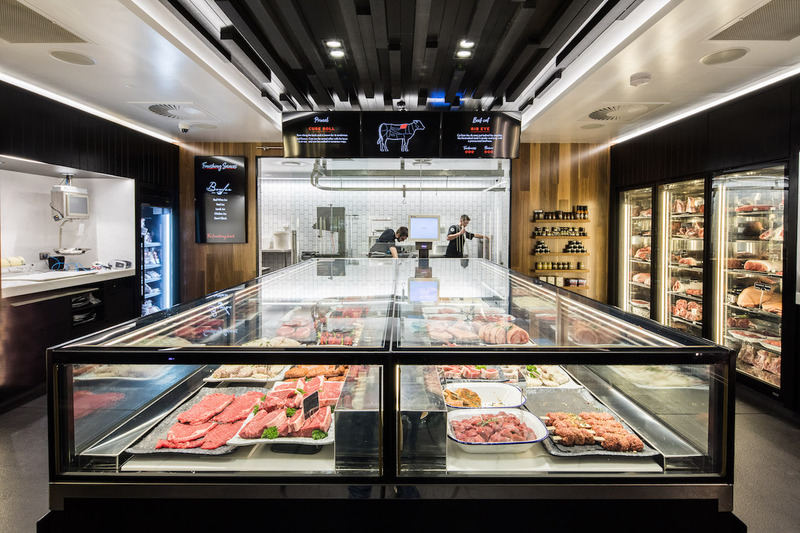 The butcher's working area is on display through floor to ceiling glass. Butchers consult customers on the floor and help make selections from the cabinets. The Peter Augustus retail concept by Gordon Simmonds from ID Solutions provides a distinct and memorable branded experience for its customers. 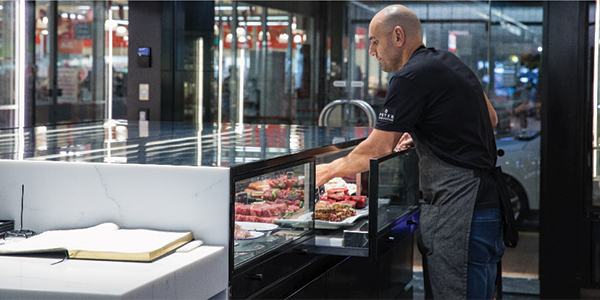 The breakdown of the established butcher retail model allows a much more engaging and intimate service between customers and expert butchers. The promise that Peter Augustus has created is providing consistently excellent product along with a service interaction more like a consultation than simple 'counter service'. If butchery is a craft, then Peter Augustus Craft butcher store in New Farm is a work of art.